Kipferl is an Austrian kitchen serving typical snacks and meals such as sauerkraut, schnitzel and knodels. What did you think of Kipferl? Brillant little piece of Austria in London! I hope they'll have an outlet in south London soon. Fed up of the same old boring sandwiches and cups of tea? 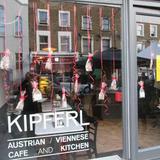 Kipferl promises a twist on the usual cafe experience with Austrian and Viennese specialties. Exciting, ja? Kipferl has recently relocated to Islington and they’ve clearly taken the opportunity to really go to town with their interior decor. Sticking to the Austrian theme, walking in here is akin to stepping into a log cabin, with the wooden floors extending round to cover much of the walls and ceilings. However, the simple space is given a lighter edge with a few choice cream walls, a large window to the front of the restaurant and lots of funky light fittings. The adequate seating comprises a mix of sofa-style seats around the periphery of the room with neat dining tables and more traditional high-backed chairs filling the rest of the room. 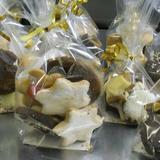 Otherwise, it’s all about the serving counters, which are big and offer you mouthwatering glimpses of the grub on offer. 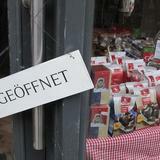 Kipferl may not have been open long but it seems that word of mouth has already spread and the locals have picked up on a new eatery offering something different. After all, there aren’t many cafes in London promising such authentic Austrian grub. 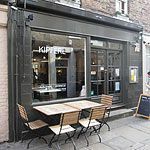 Perhaps it’s the pleasant setting, but there’s a definite overriding sense of being at ease at Kipferl, with a laid back attitude and staff that are keen to ensure that not only will you want to come back for more, but you'll bring all your mates too. And it certainly seems to be working. OK so prepare to be a little confused by the Kipferl menu if you’re not used to Austrian food, but therein lies the fun of this restaurant – it’s all about discovery. And the staff are more than happy to offer recommendations and answer any questions you may have. And best of all you can go all-out here as you can easily eat for under a tenner or could pop in for a quick lunch for as little as three quid. Bargain. Of course, you have to try the restaurant’s namesake – the kipferl, similar to a croissant with a slightly more doughy texture, slather on butter and jam and it makes for a delightful – if slightly unhealthy – breakfast or snack. Otherwise, if you want something more substantial, their soups are excellent – thick, generous and full of ingredients. The cheese and onion soup mixes tangy flavours with a creamy undertone and priced at less than £4 it’s worth every penny. Otherwise, you can try one of many strange-sounding sausages, all promising to be well seasoned and filled with spices and flavour. And don’t forget a big side of sauerkraut, naturally. If you want to experience Kipferl but aren’t feeling very experimental then they do offer options like salad and a huge array of cakes that look very enticing. Still not tempted? Then try the luxury chocolate Zotter Bars… just Google them. Drinking a coffee here – which is cheaper than at Starbucks – is an experience in itself. It’s brought out in the traditional Austrian way – on a tray with water and milk in little jugs and a bar of Milka chocolate on the side. Something about the theatre of it makes popping in for a quick coffee here all the more enticing. If you prefer something stronger then they’ve introduced an interesting menu of Austrian wines, which you’ll probably struggle to find anywhere else, and they even have Austrian beer like the hard-to-find Hirter Privat Pils. If you want to try something different and experience a cuisine you’ve possibly not tried before then Kipferl is worth a (Viennese) whirl!